Baby teeth are important for your child’s overall health and development. Many parents do not worry too much about their child’s baby teeth because they think that they are “just baby teeth” and will fall out anyway. For holding space for the permanent (adult) teeth. For guiding the growth of the face. It may be difficult or painful to bite into healthy foods, like an apple. It may be difficult to make certain sounds, like “s”, “r”, or “t” sounds. There may be problems when the permanent teeth try to come into the mouth. There may not be enough room for the new teeth. If your child has untreated cavities in their baby teeth, there is a good chance that their permanent teeth will develop cavities too. 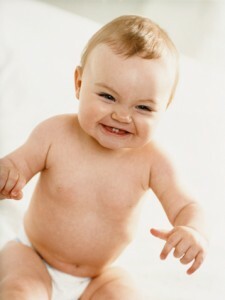 Clean baby’s mouth at least once per day by gently wiping the baby’s gums and tongue with a clean, wet baby washcloth. This cleans milk or food away from the mouth and helps the baby get comfortable with having someone clean their mouth. Clean baby’s teeth each day as soon as they appear in the mouth with a soft infant toothbrush twice a day. Gently brush the tooth surface with tiny circles. Continue to wipe the baby’s gums and tongue with a clean, wet baby washcloth. Parents continue to brush the child’s teeth twice a day until they can do it without supervision – usually about 8 years old, or when they can make the tiny circles themselves. Parents floss for their children daily when the children’s teeth begin to touch each other. Flossing removes the food and germs that the toothbrush cannot reach. Fluoride helps to strengthen teeth. A smear (size of a grain of rice) of fluoridated toothpaste for babies, or a pea sized amount for children older than 2 years, will help the teeth repair themselves and make them stronger. Drinking fluoridated water, or getting fluoride drops from your doctor or dentist, will help get fluoride to the teeth that are growing in the gums and jaw before they come into the mouth. Parents follow the same dental health routines as their children. Children learn by watching their parents practice good health habits. Mouth care is especially important during pregnancy. Changes in hormones may make gums swell or bleed. This makes flossing and brushing more important than ever. Pregnant women should have a dental exam to be sure that your teeth and gums are in good condition before the baby is born. If you have a question about taking care of you or your little one’s teeth click the “Ask a Health Educator” button or call 315-732-4657.